Just in are images from the Transformers 4: Age of Extinction Tokyo Premiere. Get a look at the event with actors Jack Reynor and Nicola Peltz as well as Japan celebrities Shoko Nakagawa and Sou Takei who attended the Japan premiere at the Toho Cinemas Nihonbashi on July 28, 2014 in Tokyo, Japan. Read on to see all the images. Get your Medicom Devil Man fix at the Toy Tokyo booth #4845 during SDCC! This soft vinyl release stands 12” tall and feature amazing red, blue, yellow, green, and black details on a purple vinyl base. These should retail in the $130+ range. Toy Tokyo’s booth #5337 will be home to the SDCC Exclusive GID Cap’n Cornstarch by Ron English. Ron will also be hanging out at the booth on Friday to sign and sketch for his fans! Stay tuned for more information on exclusive and signing schedules for Toy Tokyo. Here is another video clip from the extremely amazing TOKYO TOY GUY Movie that was done by our good friend Yuji Ueda, who lives in Dubai. 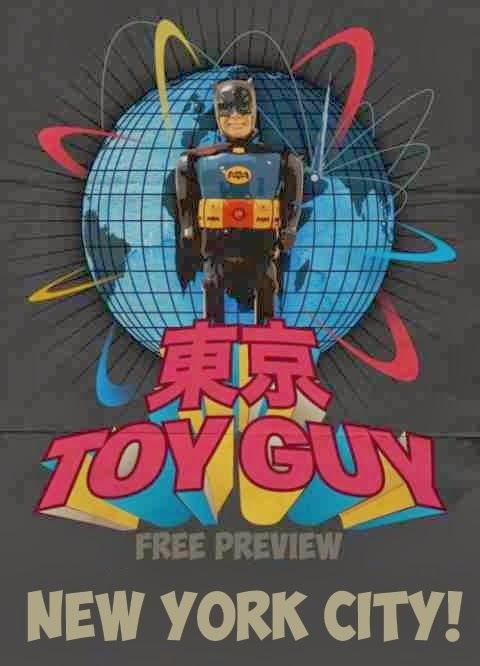 For the documentary film he made Yuji went all over the world to meet some of the most serious BATMAN Toy Collectors and in this clip we get to see when he went to New York City to visit our friend CHIP KIDD. The video here shows some extremely rare BATMAN toys, Collectibles, and Original Comic Book Artwork. Speaking about the art, we get a chance to see some of the Japanese Manga art that was drawn by Jiro Kuwata. This was the inspiration for Chip Kidd’s book, “Bat-Manga! : The Secret History of Batman in Japan” (Pantheon 2008).